Get back to nature and escape busy city life on our Atherton Tablelands Tour. As you get away from Cairns for the day, we’ll show all the good spots, including pretty cascading waterfalls, lush rainforests, and cool waters set amongst millennia-old landscapes. We’ll start the day by taking you from Cairns to the Gillies Range, passing incredible scenery as we go. On the way, we’ll stop off at the impressive and popular Cathedral Fig Tree, where you can see nature at its finest. Once we’ve finished there, we’ll move on to Lake Barrine, another natural hotspot set in a volcanic crater lake. Here, you can explore some of the area’s most impressive scenery and learn more about the natural wonders that characterise it. 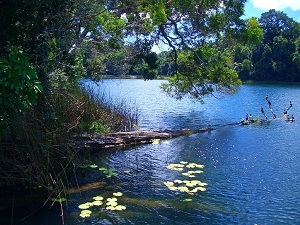 Before we stop off for lunch, we’ll take you to Lake Eacham, where you can cool off after a morning of exploring. After lunch, we’ll venture on through the tablelands’ countryside, making pitstops at cascading waterfalls along the way. You’ll have the chance to dip into the refreshing pools of the falls, and marvel at the stunning scenery that surrounds them. The most popular waterfall in the area is Millaa Millaa Falls, and we’ll take you there before an exciting jungle trek up the Dinner Falls. While there, you’ll be able to see and explore the huge crater in Mount Hypipamee National Park. 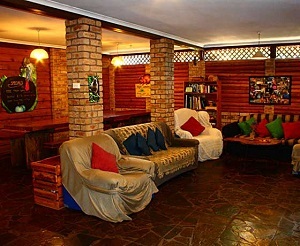 Before we head back to Cairns, we’ll stop off at On the Wallaby Lodge. Here, you can recharge with a refreshing cup of tea or coffee, which marks the perfect way to end a day exploring the Atherton Tablelands and everything they have to offer. This tour is the perfect introduction to the region, giving you the chance to explore everything the Atherton Tablelands are known for and more. As well as unique natural wonders like volcanic craters and the impressive Cathedral Fig Tree, you’ll learn all about the picturesque landscape and discover picturesque waterfalls and lush scenery. 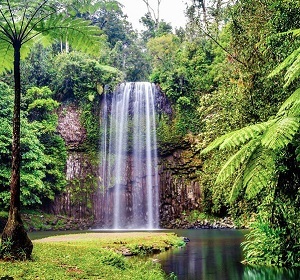 There’ll be plenty of opportunity for you to take refreshing dips in the many watering holes along the way, including the base of popular Millaa Millaa Falls and the stunning expanse of Lake Barrine. It’s the perfect chance to escape the hustle and bustle of city life in Cairns and experience the landscapes that make rural Australia so incredible.